Micron 5100 Enterprise SSD: Foundation for Big Data, Analytics and Streaming with Flexibility, Performance and Value. 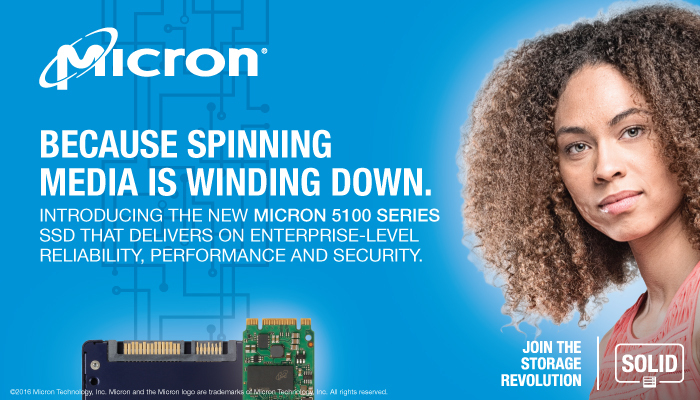 Introducing the Micron Enterprise 5100 Series SATA SSD product family, enabling future-focused storage platforms to meet the combined demands of performance, capacity, and enterprise-class reliability. Micron’s 5100 Series SSDs provide IT with an easy migration path to bridge the infrastructure divide to tomorrow’s all flash data center. Unmatched Capacity: The 5100 Series satisfies a wide range of capacity demands, reaching up to 8TB – 2X that of the nearest SSD manufacturer. Consistent High Performance: Meet the demands of your data center. The 5100 comes in three models – ECO, PRO, & MAX – optimized for varying workloads with consistent, steady state random writes at 74,000 IOPS. Comprehensive Security: Addresses enterprise security concerns with market-leading data protection and encryption (AES-256 bit encryption, TCG-enterprise protection in a FIPS-validated SATA SSD) with zero performance impact. Ultimate Flexibility: FlexPro™ firmware architecture paves the way for customers to future-proof their storage investment, enabling IT managers to easily tune specific drive features. Learn more about our pack of revolutionary 5100 drives. Triad is now ISO 9001:2015 Certified! Triad Magnetics is proud to announce that we have recently been certified to meet ISO 9001:2015 standards. This certificate verifies that our quality management system has been assessed and registered as compliant with the requirements of ISO 9001:2015 for the design, development, supply, and support of power transformers, inductors, and power supplies. In our latest blog post we explore the requirements for the latest ISO 9001 standard and what these improvements mean for you and your company.